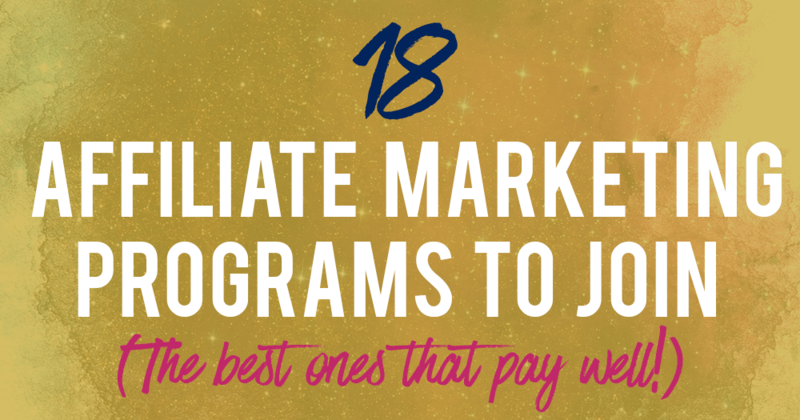 18 Top Affiliate Marketing Programs That You Must Join! This is part 2 of 5 of the affiliate marketing series. Part 1: What is Affiliate Marketing, And How Does it Work? When it comes to choosing an affiliate program, I go by the 80/20 rule. 80% of affiliate marketing programs won’t make you any money, and 20% will make you most of your affiliate revenue. In today’s post, I’ll tell you where you can find the 20%. Here a list of the top affiliate marketing programs that pay well and are reliable. But first, what’s an affiliate marketing program? Affiliate marketing works like this: Someone offers an affiliate program, and another entrepreneur signs up for it to become an affiliate. Affiliate networks are networks that form partnerships with a ton of affiliate programs. You can sign up for different affiliate programs from a single affiliate network. To accommodate bloggers from different niches, I will not be pointing you to specific products but to the best networks where you can find a ton of things to recommend. So, which are the most popular affiliate programs in today’s context? You can recommend just about anything and get a commission from it! Note: If you’re based internationally (not in the US) the minimum payout is $100, where they pay you by check. Sign up to be an amazon affiliate. Shareasale has a great reputation for being honest and reliable, and you can find a wide variety of products to promote. It’s also been in business for a long time. I don’t know about you, but I don’t want my commission to be eaten up by an ad network company. They also have real-time tracking, so you will know when a banner is clicked, or when a sale was made. Sign up for Shareasale here. CJ Affiliate is one of the largest affiliate networks out there with I’ve heard great things from others, so it’s here. Don’t apply to CJ until you can generate solid website traffic that will lead to conversions… They won’t approve your application. That’s what they say on their website anyway. That being said, they do have a ton of high converting products that pay really well, sometimes even better than if you sign up with the merchant directly. As a quick example, you can sign up to be a Hostgator affiliate with Hostgator, OR do it via Commission Junction, which provides greater reliability and tracking. As of now, Commission Junciton offers a higher payout (you’ll have to close a ton of sales before getting the same payout if you’re working directly with Hostgator). Check out Commission Junction here. Owned by Rakuten, Rakuten Linkshare claims to be the largest pay-for-performance affiliate marketing network on the web. This is a good place to check out! Clickbank offers a range of high-converting digital products. Many of their products promise huge results like earning a ton of money or losing a ton of weight. Many of their products promise huge results like earning a ton of money or losing a ton of weight. I personally find the products there to be a little “spammy sounding”. You know… those auto-play video sales pages and 99% off the product.. things like that. You can bet that these are high-converting products though, and there ARE high-quality products there if you dig deeper, so I’m including Clickbank here. Click here to check out Clickbank. Instantly access ~20,000+ merchants. All you need to do is mention your website. Their technology will automatically start affiliating existing unaffiliated links in your content. It creates the affiliate link for you, so you don’t have to worry about the hassle of network sign ups, approvals or creating affiliate links. Viglink is similar to Skimlinks. However, I’ve heard of a lot of people loving Skimlinks, and Viglink gets less love. Well, you may like the underdog. Add links into your posts promoting various products with Viglink! If you are looking into promoting software and SaaS companies, Avangate is the place to check out. You probably bought stuff from Ebay before – so why not join Ebay’s affiliate program? You didn’t know Ebay has it’s own affiliate program, huh? Well they actually do have one and it’s been running for quite some time. Sign up for the Ebay Partner Network here. Here’s an even greater shocker… Etsy has its own affiliate program! Affiliate Window is the company that manages Etsy’s affiliate program. If you’re like me and love looking at pretty crafts on Etsy, you may want to profit from it. Promote all that creative work by signing up with Affiliate Window. Affiliate Window also claims to be the largest affiliate network in the UK. It is very easy to set up and they do have a user-friendly interface. I’ve also heard that their support is good. They do require a $5 deposit that they’ll return upon approval. They will send it back to you when you earn enough to get your first payout. Check out Affiliate Window here. I’ve heard only good things about Pepper Jam Network. They currently work with 1200+ brands. Check out Pepper Jam Network here. Recommend your favorite songs, books, movie and apps with iTunes’s program! Check out iTunes’s Affiliate Program here. 13. Shopher – Monetize your website audience with America’s most popular consumer brands and retailers. Continue on to part 3: 10 Crucial Tips to Make Money With Affiliate Marketing. « What is Affiliate Marketing, And How Does It Work? This article helped me a ton! I am just starting out, and really enjoyed the helpful information. All of this is so new to me, but so far I am enjoying learning! Great post and thanks for the recommendations? Was just curious if you’ve heard about FlexOffers? This is such a great list! I only knew about Amazon Associates and ShareASale. Now I have more to add to my list of favorites. Thank you, Raelyn! Hi! Great Article. Love that you didn’t just post a list of Affiliate like I see so many times. I have a new(ish) Business that is geared towards helping Small Business owners break into their Online marketing presence. One part of an Online Business as you probably already know is Affiliates. Thanks again for the advice! Yay! Thank you so much for these great suggestions. I will be checking them out! ? I’ve always been pretty cautious when it comes to affiliates. But after reading this I think I’m going to have to delve a little deeper! Thank you for the article and the helpful information! You’re welcome, Simon! Thanks for stopping by! This is really useful, do any of these pay per click as well? Thanks for the info. I want to ask, it’s to focus on one affiliate or promote several affiliate program? Focus on a few high converting ones. Great, Anita! 🙂 Thanks for stopping by! Raelyn I dig this list. Amazon Associates is my fave marketing program since I have many eBooks on the platform. Double dipping. May I expect your esteem support to make my venture more valuable? Thank you for your post-so much great information. I appreciate you putting it together for us.